Inland Container Depots (ICDs) and Container Freight Stations (CFSs) are also called dry ports as they handle all Customs formalities related to import and export of goods at these locations. In a multi modal transport logistics system, ICDs and CFSs act as hubs in the logistics chain. According to Ministry of Commerce (MoC) guidelines, an Inland Container Depot (ICD)/Container Freight Station (CFS) may be defined as a common user facility with public authority status equipped with fixed installations and offering services for handling and temporary storage of import/export laden and empty containers carried under Customs control and with Customs and other agencies competent to clear goods for home use, warehousing, temporary admissions, re-export, temporary storage for onward transit and outright export. Transshipment of cargo can also take place from such stations. ICD and CFS offer services for containerisation of break-bulk cargo and vice-versa. Most ICDs are connected by rail to the respective gateway port, and this is a key difference between the ICD and CFS. CFSs are typically adjoining or are in close proximity to the mother port and often do not have rail connectivity. Receipt and dispatch/delivery of cargo. Transit operations by rail/road to and from serving ports. Consolidation and desegregation of LCL cargo. Temporary storage of cargo and containers. Maintenance and repair of container units. An overview of ICDs and CFSs is presented below. According to the data maintained by the Department of Commerce (DoC), there were 129 ICDs in the country as of March 2017 (Appendix I). According to the data provided by CBEC (now CBIC), there were 80 active ICDs in the country. These include the ICDs set up before the DoC was made the Nodal agency for setting up of ICDs in 1992. As per the CBEC data on active ICDs, the state-wise distribution indicates that Maharashtra region has the maximum number of ICDs (13), followed by Uttar Pradesh (11), Tamil Nadu (10), Haryana (9) and Gujarat (8). Delhi has the largest ICD in India, namely ICD Tughlakabad. There are no ICDs in the northern-most state of Jammu & Kashmir and there is only one ICD at Amingaon, Assam which caters to the entire north-east. In terms of volume of transactions (Bills of Entry for Imports and Shipping Bills for Exports), the highest volume of trade through ICDs was generated in Delhi (22 per cent), Uttar Pradesh (16 per cent), Tamil Nadu (14 per cent), Karnataka (10 per cent), Gujarat (8.5 per cent) and Maharashtra (7 per cent). These six states together accounted for 78 per cent of India’s total ICD transaction volumes. In 2016-17, out of the 80 active ICDs in the country which handled a total of ₹ 4,27,404 crore worth of imports and exports, there were ten ICDs which accounted for 61.2 per cent of the total value of trade. Of these ten, there were five ICDs in particular, which accounted for ₹ 1,94,485 crore (45.5 per cent) of the exports and imports. These were ICD Tughlakabad, Delhi (19.8 per cent), ICD Whitefield, Bengaluru (7.4 per cent), ICD Sabarmati (7 per cent), ICD Tuticorin (5.8 per cent) and ICD Garhi Harsaru, Gurgaon (5.6 per cent). In absolute rupee terms, value of year-on-year imports through ICDs increased from ₹ 117,455 crore in FY 2013 to ₹ 162,469 crore in FY 2017. Growth trend indicated that imports grew at a rate of 16 per cent between FY 2014 and FY 2015 but started declining from FY 2016. The annual growth rate was a mere 0.6 per cent during FY 2016 and picked up only marginally to 1.5 per cent during FY 2017. Value of exports through ICDs increased from ₹ 190,249 crore in FY 2013 to ₹ 264,935 crore in FY 2017. The annual growth rate was an impressive 27.5 per cent during FY 2014 but dropped to 8.2 per cent during FY 2015, declining further by 3.1 per cent in FY 2016 before the trend was reversed with an increase of a modest 4.2 per cent in FY 2017. The graph below shows the all-India trend of growth in imports and exports through ICDs. Data on volume of cargo handled annually in TEUs was available for 37 (Appendix IA) out of the 382 functional ICDs test checked in audit, from which it can be seen that TEUs handled by these 37 ICDs increased from 13.41 lakh in FY 2013 to 15.96 lakh in FY 2017, an increase of 19 per cent over a four-year period. It is noticed that volume of containerised traffic handled by ICDs showed an increasing trend till FY 2015, after which there was a decline of 2.2 per cent in FY 2016. Decline in TEU volumes was mainly due to decline in export TEUs handled between 2014-15 to 2015-16. The growth rate again picked up by 4.2 per cent in FY 2017. Transaction data of imports and exports over the period 2012-2017 was analyzed for the commodity profile of imports and exports taking place through the ICDs. The commodity profile is based on product categories defined in twenty one sections of the Indian Trade Classification: Harmonized System (ITC-HS) and the equivalent sections of the Customs tariff schedule. Major product categories imported (value-wise) through ICDs during FY 2013 to FY 2017 were (i) Mechanical and electrical equipment and their parts (26.4 per cent) (ii) Base metals like Iron, Copper, Nickel, etc. and their products (21.3 per cent) (iii) Plastics, rubber and their products (13.67 per cent) (iv) Chemicals, Fertilizers, Medicines, Soaps, Cosmetics, etc. (7.7 per cent) (v) Textiles and textile products (5.6 per cent), etc. The commodity profile of imports remained largely the same throughout the five-year period 2013-2017, except in FY 2015 and FY 2016, when the product category ‘Gems and Jewellery, Precious Metals, Coins, Pearls, etc.’ witnessed substantial imports and it was among the top five product categories imported in these two years. During FY 2013 to FY 2017, major product categories exported (value-wise) through ICDs were (i) Textiles and textile products (24 per cent), (ii) Chemicals, Fertilizers, Medicines, Soaps, Cosmetics, etc. (12.5 per cent) (iii) Mechanical and electrical equipment and their parts (12.3 per cent), (iv) Base metals like Iron, Copper, Nickel, etc. and their products (12.1 per cent) (v) Cereals, Spices, Fruits, Tea, Coffee, etc. (10.1 per cent), (vi) Automobiles, Aircraft, Ships, Boats, Locomotives, etc. (7 per cent). Textiles and Textile products have been the highest exported product category throughout the five-year period 2012-2017. The export value of this product category more than doubled from ₹ 37,601 crore in FY 2013 to ₹ 77,691 crore in FY 2017, the increase in their share of total exports through ICDs being from 19.7 per cent to 29.3 per cent. On the other hand, the product category ‘Cereals, Spices, Fruits, Tea, Coffee, etc.’, which was the second largest product category in FY 2013 and FY 2014, became the fifth largest product category in FY 2015 and slipped further to sixth position in FY 2016 and FY 2017. The export value of this product category decreased from ₹ 31,252 crore to ₹ 16,620 crore during this five-year period. As seen from Figure 7, in 2016-17, the largest source of India’s imports through ICDs was China (34 per cent), followed by Japan (8.6 per cent), South Korea (5.7 per cent), USA and Thailand (both 5.1 per cent) and this trend has remained the same over the past 5 years. Figure 8 shows the country-wise profile of different product categories imported through ICDs. It is seen that in 2016-17, China was the largest source of imports of all mechanical and electrical goods, base metals, chemicals and fertilizers, textiles, plastics and rubber products. USA was the largest source of paper and paper products and Japan was the largest source of imports of automobiles and parts thereof. As seen from Figure 9 in 2016-17, the main destination countries for India’s exports from ICDs were USA (17.6 per cent), UAE (10.8 per cent), UK (5.6 per cent), Colombia (4.6 per cent) and Germany (4 per cent). (The year-wise exports through different ICDs can be seen in the interactive graph by selecting a particular year and ICD Port Code). Further, Figure 10 shows the country-wise profile of different product categories exported from ICDs. It is seen that in the year 2016-17, main exports to USA were chemicals and fertilizers, mechanical and electrical goods, base metals, automobiles, and cereals, spices, fruits, tea, coffee, etc. while UAE was the main export destination for textile and textile products. According to the data maintained by the Department of Commerce (DoC), there were 168 CFSs in the country as of March 2017 (Appendix I). CBEC provided summarized data of these CFSs to Audit. As per the CBEC data for the year 2016-17, Tamil Nadu had the highest number of CFSs (50) followed by Maharashtra and Gujarat with 43 and 24 CFSs, respectively. As per the CBEC summarised data on CFSs, CFSs in Maharashtra handled the maximum number of import and export transactions (42.6 per cent) followed by CFSs in Tamil Nadu (21.9 per cent) and Delhi (14 per cent). However, since there are no CFSs in Delhi, it appears that the data may pertain to Air Freight Stations. 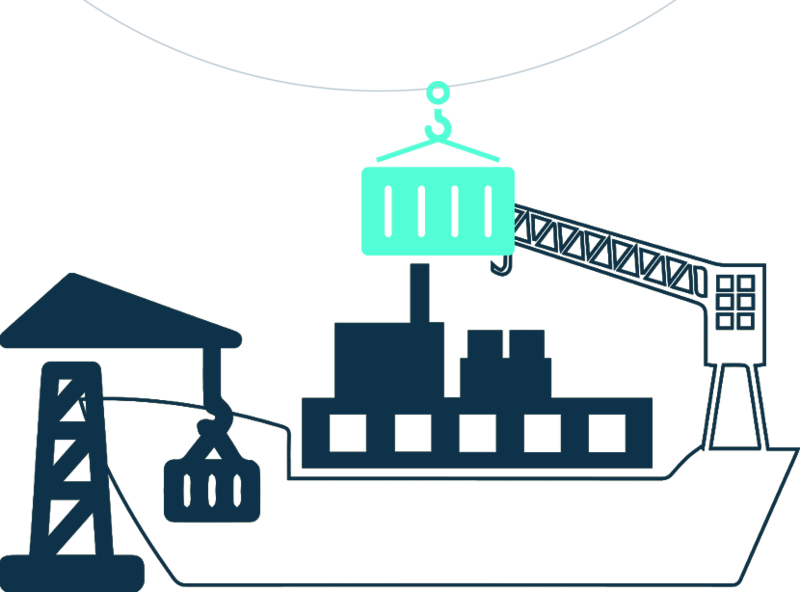 CFSs function as an off-dock facility of the main/mother ports and their function is to help decongest the main ports by shifting cargo and Customs related activities outside the port area. CFSs are largely expected to deal with break-bulk cargo originating/terminating in the immediate hinterland of a mother port and may also deal with rail borne traffic to and from inland locations. A comparative analysis of imports which were handled through CFS vis-à-vis the mother port shows imports handled through mother ports far exceeded the imports handled at concerned CFSs. On the other hand value of exports effected through CFSs was much higher than the exports through mother ports. Thus it is clearly seen that CFSs are the preferred destination for handling of export consignments while imports through the main ports continue to predominate in comparison to the imports made through CFSs. Data was collected from 40 out of 41 CFSs selected as sample in Audit (Appendix IB) on volume of cargo handled annually (in TEUs). TEUs handled by CFSs increased from 14.68 lakh in FY 2013 to 17.98 lakh in FY 2017, an increase of 22.5 per cent over a four-year period. However, there was a sharp decline of 8.8 per cent in the volume of exports in TEU terms as well as a marginal decline in volume of import TEUs, with a corresponding overall decline in total volume of traffic by 2.5 per cent in FY 2017 as compared to the previous year.